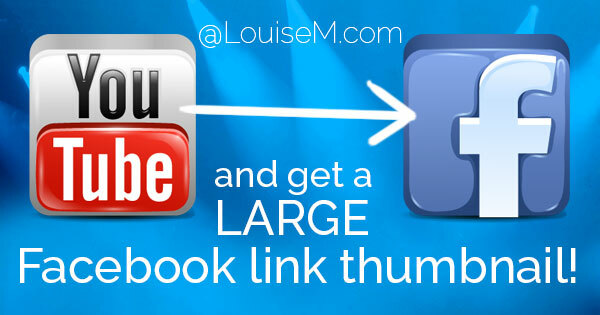 Wondering how to post YouTube videos on Facebook – and get a LARGE link? Facebook seems to have an adversarial relationship with YouTube, which is owned by Google. If you share a video, you just get a small thumbnail instead of those great BIG clickable thumbnails that really drive traffic. This new service will allow you to upload your own image with the video link – and the image will also link to the video! Sorry, this service has changed and now has a hidden fee. We can no longer recommend it. Head to (no longer a free service so we removed the name and link). Click Get my Link and copy it, or share directly to Facebook. That’s it! Check out the video below for a walkthrough of the process. *NOTE ON IMAGES: Only use images you have rights to use. Using frames from someone else’s video may be copyright infringement. I suggest you create or crop your image to the 1.91:1 proportion that will be seen in the video before uploading. Note how the second image shown in the video has the penguins’ heads cut off! I recommend a minimum of 600 x 315 pixels, up to 1200 x 628 pixels. NOTE: If you OWN the video, you can upload it directly to Facebook and have it play right in the news feed. I don’t recommend you download videos to post on Facebook, as that’s a breach of Google’s terms of service (see section 5:1). 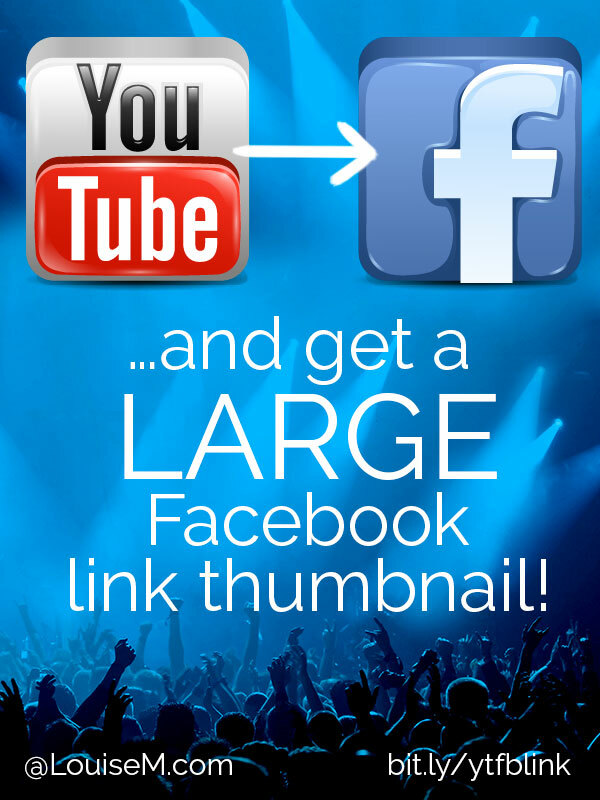 Please share this post with others who’d like to know how to post YouTube videos on Facebook! Thanks Caroline! I found that they changed the video URL for some reason – it seems like the same video to me. But it now works! Can’t wait to try this, Louise. Thank you!!! Hey, just out of curiosity, is there a workaround available to change the link “name”? I tried using bit.ly but it converted back to the smaller thumbnail. Also is there any way of getting this method to play on directly from the Facebook page as opposed the “target_blank” that this method appears to use? Neither are dire, just trying to optimize the socials as much as possible. Thanks for the info that was outlined though! I don’t believe there’s a way to change the link name. The only way I know of to get a video to play on FB is to upload it to FB – not to post a link. Can I just download the video and upload it on my page and mentioning “credits to the owner”? As mentioned in the post, it’s against the terms of service to download videos. Tried other videos and had the same problem. I’ll test it and see what happens. I’ll update the article if it appears it’s been disabled by Facebook. There’s a new version of this out at http://yt2fb.com that works far better in my opinion. Not as many options yet but simple and it’s still functioning. Sounds great, thanks for sharing, Ben! Making it simple use createyoutube.com for creating big thumb for youtube videos and share that url. Video will play directly in post. But the thumbnail is not showing on Fb desktop ? Sadly, this is does not work. When you click link to FB. It links some other video. If you want to post a YouTube video. Copy the video url link and post it on your FB. Thanks. Facebook is always changing things! Thank you very much for the great how-to post .. Helped me a lot to increase my page views..
this made my day! Took me a year to find this technique. My older fb posts were not working very well. Hope this will bolster my traffic. Thank you for sharing! Thanks, Louise! I muddled around trying to figure this out myself and was totally stumped until I found your tips. You’re the best. Does it effect to my youtube video view? Most likely, because it’s more visible in the news feed. That’s probably due to the dispute between FB and Google products. I’m not an expert in YouTube. Thank you, so much for the wonderful tool. Makes life much easy and more fun. If I would a like to share a music video from Youtube to my Facebook, how can I activate the comment and like section? I have noticed that Youtube videos shared on Facebook, the like and comment section has been disabled. I haven’t heard of this, but I don’t think there would be a way to enable something that FB has disabled. This is total CRAP! Nowhere in the article does it mention that this is a fee-based service Yet, you have to pay in order to upload an image or EVEN USE A YOUTUBE LINK (which is what this is all about after all). I don’t mind paying for a service if I know that’s the deal up front but I DON’T WANT TO FIND OUT ABOUT IT AFTER I GIVE THE 3RD PARTY ACCESS TO MY FACEBOOK PROFILE INFORMATION. Apparently it changed because I was able to use it for free. I’ll remove the link. There is a great alternative called vidrise that offers a free tool and is highly customizable. It can be shared to Facebook, Twitter & Google Plus and also provides statistics about the engagement which is handy for those that like counters! 🙂 If you generate more than 10 videos a week, there is a fee-based upgrade.